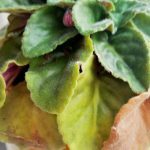 I have grown african violets for years (live near Toronto, Ontairo, Canada) without major problems. I just bought a new one and it seems to be planted in an artificial soil substitute that doesn't stay wet for very long. I'm going away for a week and am concerned to keep the 'soil' damp. Any suggestions? Many African Violets come in a peat substrate that sounds like what you describe. This is fine. These can handle a dry period for just a little while, and I believe with correct bottom watering, that they will be alright for a week without further watering.